Australia’s Casey Stoner followed up his first win of the season at Aragón (Spain) with a second victory of 2010 in the Grand Prix of Japan this afternoon. It was another strong win from the Ducati rider as he slowly pulled away from pole-man Andrea Dovizioso throughout the 24-lap race. The real excitement was drawn from team-mates Valentino Rossi and Jorge Lorenzo’s intense battle for the final spot on the podium. As he did last time out at Aragón, Stoner got a fast start and took the lead on the opening lap. 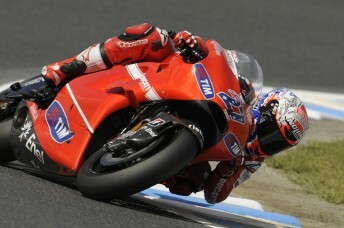 As he settled into his rhythm and consistently posted fast laps, Dovizioso stuck with him for the early stages. Lorenzo hinted at what was to come as he passed Rossi to assume third, and that was just the start of the duo’s enthralling contest. Stoner began to open up a slender lead over Dovizioso which grew to a second with seven laps remaining, while further down the order Loris Capirossi (Rizla Suzuki) was forced to retire when his bike stalled as he ran wide alongside team-mate Álvaro Bautista in the chase for seventh place. With Stoner now assured of victory and Dovizioso a return to the podium after an eight-race stint without a top-three finish, Rossi and Lorenzo locked horns. Repeatedly pushing one another the pair touched bikes with two laps to go as they fought side by side in a rousing finale to the race. Victory for Stoner came by a margin of 3.868s and Dovizioso’s fifth podium of the season (his first since Silverstone) was also confirmed. Rossi managed to hold his own in third place and score a seventh rostrum result of 2010, and in the process ensure that Lorenzo finished outside the top three for the second successive race. “After the first couple of laps, I saw the lap times I could do and thought we could be in with a chance to win this one but this wasn’t without a fight,” said Stoner. “Andrea was there the whole way, pushing me and pushing me. Every time I thought I had a small gap just to take a breather, he came back again and then pulled those couple of tenths that I’d given. Edwards posted a season’s best result of fifth, with Simoncelli sixth and Bautista seventh. Spies Randy de Puniet (LCR Honda) and Hiroshi Aoyama (Interwetten Honda MotoGP) completed the top ten. Lorenzo’s lead at the top of the Championship was extended to 69 points from the absent Dani Pedrosa. Stoner remains in third, with Dovizioso leapfrogging Rossi into fourth. Meanwhile, Repsol Honda rider Pedrosa has had a titanium plate inserted to help fix his fractured left collarbone during a successful two-hour operation at midnight in Barcelona. He will now remain in hospital for between 24 and 48 hours. The only rider who still has a mathematical chance of challenging Lorenzo for the title, Pedrosa fell during free practice. “Dani had a four-fragment chip fracture of the left collarbone and, together with Doctors (Victor) Marlet and (Ignacio) Ginebreda, we have performed a fixation with a titanium plate, made especially for the collarbone,” said the surgeon in charge, Dr. Xavier Mir. 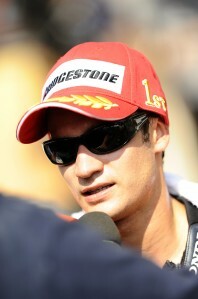 Pedrosa also sprained his left ankle in the fall. 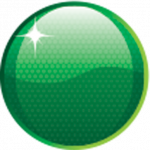 “Regarding the left ankle, while in surgery, we performed another stress X-ray and saw that we were dealing with a Grade 1 ankle sprain, which will heal in a short space of time,” said Dr. Mir. After his crash Pedrosa flew in the evening from Japan to his home city of Barcelona, arriving in the early morning in understandable discomfort following the 18-hour journey via Paris.